President Serzh Sargsyan started the second day of his working visit to the Kingdom of Belgium by visiting the Carnegie Endowment for International Peace in Brussels. Hosted at this prestigious research institution, President Sargsyan met with the experts of the Center. The moderator of the meeting, a scientific researcher of the Carnegie Endowment Stephen Lehne, who has been studying the EU foreign policy developments and relations among the member states since the Lisbon Agreement, presented Serzh Sargsyan to the audience. 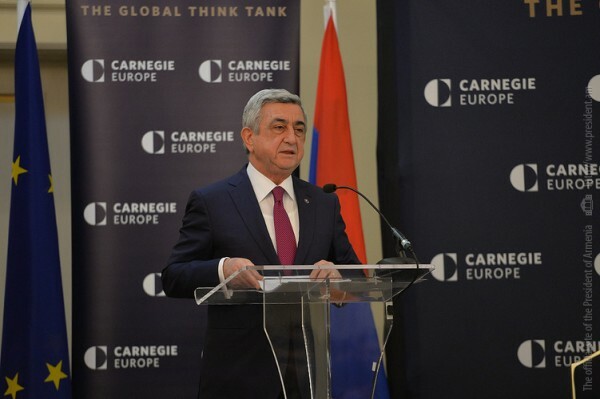 President Serzh Sargsyan made a statement and answered the questions raised by the participants of the event. The audience was interested in Armenia’s foreign and internal policies, as well as in the RA President’s viewpoints and assessments on the regional and international pressing issues. It is a great honor of course for me to speak at the event held at the Brussels office of the Carnegie Endowment for International Peace. I am here for the first time but I recall warmly my meetings and discussions held at the Carnegie headquarters in Washington, D.C. Reputable platforms such as this one, on one hand provide the opportunity to present the logic behind the developments taking place in our country, and on the other hand, we learn from the very source about the latest expert analysis, estimates, and approaches. Finally, the very idea of international peace, which is laid in the basis of this Endowment, is the objective that has always attracted the entire civilized world. Andrew Carnegie once said, “Teach a man to be a good citizen and you have solved the problem of life.” A good citizen is indisputably a guarantee of the success for a state. The more mature and informed the civil society is, the more efficient the state structures are. Strong civil society, along with the separation of powers, is one of the best mechanisms for checks and balances. That was the driving force behind the process of constitutional reforms we initiated in our country, and it has been going on for over two years. The amended Constitution has defined more precisely the authority framework for different branches of power, stressing the respect for human rights and making the voice of people heard in all areas. As a result, in our country has already commenced the process of building such a political system in which the influential actors will be not the individuals but political forces, political institutions. Enlargement of political parties and formation of political coalitions is going on in Armenia at this moment; that is a welcome development, and we have been striving to achieve that. Political parties are getting consolidated as stable institutes; smaller parties are disappearing or merging together. For Armenia, to amend the Constitution was a bold step aimed on one side to the decentralization of the government, on the other hand – at the strengthening of the legal and constitutional order, which will allow to eradicate unacceptable manifestations of the post-Soviet flaws, decrease the corruption risks and provide the best possible conditions to move the country forward on the path of sustainable development. In coming weeks, Armenia’s political system will undergo a serious test: at the beginning of April, in accordance with the amended Constitution and the new Electoral Code, we will conduct parliamentary elections. Fundamental changes were introduced into the Electoral Code as well, some of which resulted from the unprecedented dialogue and consensus between the authorities, opposition, and the civil society. To ensure a considerably greater public trust towards the electoral process and to conduct free and fair elections, we have actively introduced contemporary technical measures for the election monitoring. Moreover, in line with the wishes expressed by the opposition, we agreed to introduce such transparent and novel approaches towards which certain reservations were voiced by the Venice Commission of the Council of Europe. We agreed to do it because at this point a greater trust towards the process was the most important objective. When we started the process of constitutional reforms, our major objective was not just to introduce a parliamentary model of government but to further strengthen democratic institutions through the decentralization of the authority and introduction of a fully proportional voting system. I think with this regard Armenia sets a positive example for other post-Soviet and regional countries. The reckless four-day military escapade carried out by Azerbaijan in April 2016 was the epitome of Baku’s years-long belligerent policy and ideology. It dealt a heavy blow to the NK peace process. Azerbaijani aggression proved once again that the struggle of the people of Artsakh for living safely on their own land and be free has no alternative. This is not an opinion, but the reality created and imposed on us by Azerbaijan’s policy. There are strictly defined agreements reached in Vienna and Saint Petersburg after the April war, related to upholding of the unlimited tri-party ceasefire agreements of 1994-1995 and on the creation in the conflict zone of the mechanisms to investigate violations of the ceasefire regime. However, Azerbaijan, true to its long-standing tradition, refuses to implement these agreements and declares that their implementation will allegedly reinforce the existing status quo in Nagorno Karabakh. If Azerbaijan is truly concerned with changing the status quo in Nagorno Karabakh, there is only one way to do it – to recognize the right of the people of Nagorno Karabakh for self-determination. It would be naïve to assume that Azerbaijan was unaware of the heavy blow it dealt to the peace process, to reinforcing the status quo, to pushing pack the peace process. Obviously, Baku is using the Nagorno Karabakh conflict to divert the attention and rising discontent within its own society related to the pressing social and economic issues and blatant violations of human rights in the country. This was just an episode from the theater of absurd which is being staged in Baku. We encounter it almost on a daily basis. However, sincere outbursts also happen. On one such instance, the leader of Azerbaijan, trying to boost his very significance in front of his subordinates, admitted publicly that at the negotiations behind the closed doors he was under pressure to recognize independence of Nagorno Karabakh, and he was the sole person able to withstand the pressure coming from the Co-Chairs of the OSCE Minsk Group. The Co-Chairs of the OSCE Minsk Group, as mediators, are also called upon to prevent possible escalation in the area of conflict. Negotiations conducted under the shelling hold no promise. That is the stage the Artsakh conflict resolution process has reached now. Both Artsakh and Armenia are in principle against the use of force and are in favor of solving the problem as soon as possible through peace negotiations. Azerbaijan’s new attempts to engage in a military adventure can have unpredictable consequences for Azerbaijan itself. Armenia, as the guarantor of Nagorno Karabakh’s security, has stated on many occasions that it was ready to respond adequately to any attempt to use force. Despite Azerbaijan’s incessant threats, the people of Artsakh continue to build resolutely their own future. On February 20, a referendum took place in Nagorno Karabakh on constitutional reforms. The people of Artsakh have voted for the presidential model of governance. As you see, with regard to the system of governance, the positions of Armenia and Nagorno Artsakh differ; however, the resolve to build a democratic system is unwavering. The people of Artsakh have been manifesting that resolve for decades – they formed through the elections their executive, legislative, and local government bodies. The people of Artsakh dream of no other future and are busy with creating a free society based on human rights and basic liberties. Just as anyone in the democratic world, people of Artsakh have every right to enjoy all universal and fundamental freedoms. People of Artsakh know better than anyone the price of being free because they paid for it with the blood of their sons. Today, Artsakh is building democracy under fire. Azerbaijan, meanwhile, is trying to silence the voice of freedom, urging to condemn democratic processes in Artsakh. While Artsakh is taking consistent steps on its path towards a consolidated democracy, its neighbor Azerbaijan, especially at the current stage, has been taking consistent steps towards the establishment a totally hereditary tyranny. I see that all gathered here are notable experts. If there are alternative mechanisms of governance and self-organization for unrecognized entities, I would appreciate if you let us know. It is hard to explain to our colleagues in Artsakh why the unrecognized Kosovo can cooperate with the OSCE/ODHIR and form its governmental institutions democratically, while some think that the people of Artsakh cannot do it. Even though Armenia has not recognized independence of Kosovo, by the virtue of financing the OSCE budget we are part of that process. I am confident that the international community should start to gradually assist Artsakh in its democratic processes, regardless of the status of the Nagorno Karabakh Republic. It is well-known that sustainable development is one of the most critical components of the public security, while with regard to a state, development cannot be sustainable unless it is based on a strong economy. Recent developments prove that Armenia has been able with scarce resources to form a flexible economic system. These achievements are called to verify that the main source for our economic development is the human capital. I will give you one example: the area of information and communication technologies in recent years has become one of the locomotives of our economy. In this area, Armenia is working with prominent companies such Microsoft, IBM, Sysco, D-Link, Oracle, Synopsis, Mentor Graphics and others. There are nearly 400 enterprises functioning in Armenia in this area alone, with the number of employees close to 15 thousand. In this sphere, the women in Armenia are among the most engaged in the world. In this area we register a 20-25% increase on average each year; it makes nearly 4% of the GDP which is comparable to that of many developed countries. It would be hard to ensure through the standard models of economic development the level of advancement that would allow us to withstand the current global challenges. Therefore, we need a new vision with innovative approaches and solutions. We have been able to form an economic system that is free of the impact of the raw natural resources. Armenia differs positively from a number of the regional countries, where the economic crises of the recent years resulted in the destabilization of the economy and devaluation of the national currency. Armenia proved that even under a blockade and limited availability of resources we were able to form a stable and predictable economy, which registered progress with regard to a number of international indices, in particular, the World Bank “Doing Business 2017,” as well as most recent reports by the Fitch Ratings. In accordance to “Doing Business 2017”, Armenia has improved its standing by five points and occupies the 38th position among 189 states while Fitch rated Armenia stable with B+. Our new government, which was formed at the end of last year, has come up with the impressive reforms agenda. The reforms should enhance the level of recognizability of the country and investment attractiveness, especially for the European investors; it will boost the public-private partnership, ensure a comprehensive state assistance to the business projects which will encourage a rapid economic growth. While speaking about improving Armenia’s international milieu, I would be remiss not to mention the Syrian crisis. From the beginning of the crisis and until today, over 20 thousand Syrian refugees of the Armenian descent have found a safe haven in Armenia. Certainly, it is painful to state because they are not refugees in our understanding. They are part of us, who because of certain historical developments had found salvage in Syria. Today, as a result of the unfolding tragic geopolitical developments they found refuge in Armenia. However, we are doing more than that. Armenia is regularly sending humanitarian aid to Syria: another aircraft with the cargo, days ago landed in Syria. The aid is sent not only to our fellow Armenians in Syria, but to all Syrians, regardless of their religious or ethnic affiliations. This is the least we can do as a token of appreciation to the people of Syria who once opened their doors to the Armenians who had survived the Genocide. Yesterday with President Tusk we announced that the negotiations on the Armenia-European Union framework agreement have basically been concluded. The new Armenia-EU agreement is first and foremost a political document that allows us to accommodate various interests towards the vitality of the so-called policy of “both, and.” It is true that back in 1996, we signed the Partnership and Cooperation Agreement to regulate the relations between Armenia and EU. It, however, was not fully reflecting either the real scope, or depth, or the ambitions of the Armenia-EU relations. Therefore, with the new Agreement we will register the achievements and development milestones and announce that we will continue to develop our bilateral agenda in all areas. It is important that this cooperation is based on shared values. Even at the most difficult junctions of its history Armenia has never been confronted with making a civilizational choice. Nobody is forcing upon us the implementation of democratic reforms; it is our choice. Our people view themselves as Europeans: our spiritual and cultural heritage and our lifestyle are European. It is no coincidence that today hundreds of thousands of Armenians reside in Europe, and are exemplary citizens, whose talents and hard work serve their countries. They also present an important link which connects Armenia and the European Union. It is true that Armenia’s accession to the EAEU at the initial stage was received as a thorny issue by some of our western partners. I am glad that time made things fall into place and sorted them out. We are ready to promote the mutually beneficial EU-EAEU relations to make them closer. Armenia is interested in the Pan-European cooperation. We are fully aware that cooperation is the best way to solve the existing issues, while confrontation and a policy of creating new dividing lines has no future. At the same time, Armenia has historically accumulated a rich experience with Iran, and our current close economic, political and cultural contacts make Armenia a good platform for those European companies that might wish to enter Iran. Developing an exemplary regional cooperation with Iran, Armenia has good prerequisites of becoming the safest and the shortest transit route connecting the seaports of the Persian Gulf and the Black Sea. That was the reason behind the inclusion of the North-South highway, which runs from the seaports of Georgia to Yerevan and further to the border checkpoint with Iran, among the main routes of the European Union. Friendly relations between Armenia and Georgia are an important element of the security in the South Caucasus. With Georgia, we have always able to address every issue in the atmosphere of good-neighborly relations and mutual understanding. We have never conditioned our relations with the relations with third countries. Current cooperation between Armenia, as a member of the Eurasian Economic Union, and Georgia, as an EU associated partner, proves that there are new opportunities for the mutually beneficial cooperation. Armenia is ready to become a stable partner in the region which will encourage the process of ironing out differences existing between the major actors, developing the avenues for the economic advancement and forming efficient investment policy. In conclusion, I would like to stress again the importance of a durable peace in the world and in our region. I strongly believe that any conflict can be solved through the joint efforts of the international community. It is symbolic that at the Yerevan Brandy factory there is a “peace cask” that is surrounded by the flags of Armenia, Nagorno Karabakh, Azerbaijan and countries of the OSCE Minsk Group. It is just a sign, one among many, of our anticipation of peace and reconciliation. We are looking forward to the day when we will herald to the world the establishment of a long-awaited peace in our region and celebrate it with our world-renowned brandy, opening new opportunities of development for all those living in the South Caucasus.